Summer, despite the heat, has its treats. Two such treats are the gladiolus and the canna lilies that bloom profusely around the garden here at Rosehaven Cottage. Both are very carefree in our conditions (which makes me a very happy gardener). Glads like the dense soil we have here and don't mind the dryness of our late spring and summer seasons. As long as the winter and early spring rains happen to get the glads started, then they're happy with just the little misting they get from the drip-mist irrigation system I water our garden with. Like many of the bearded iris, glads also have a neat pearlescent sheen to them that make them sparkle in the summer light. If you click on the purple glads above to enlarge the photo you might be able to see the little sparkles. 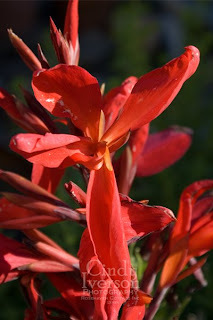 Canna lilies are very happy in our climate as long as they get lots of sun and have wet feet. There aren't many plants that like those conditions so I was happy to find that cannas like the boggy full sun area around the pond in the back garden. Even though they die back in December and look like they'll never come back, they always do. I discovered this year that I can plant canna lilies in terra cotta pots that sit on bricks IN the pond. 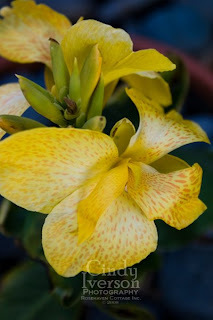 The yellow spotted canna pictured above is my latest acquisition that is growing in a pot in the pond. The bricks raise up the pot so only the bottom stays wet while the top is out of the water with blue mexican beach rocks on the top to keep the soil safe from critters. I am so pleased with the results that I'm contemplating starting a canna collection in my pond. Right now I only have three varieties of cannas around the garden with only one in the pond so I have a way to go before I can call it a "collection". Now the only issue is deciding which variety I want next. so is the price out of this world? I have a gateway and installed Vista and it is just not moving. I'm ready to switch even though I haven't used a mac. Thanks for leaving a comment on my blog. I am feeling much better, thank you. Hope you and Hubby get better soon too! The flowers are so beautiful! Lovely colours and shapes. Beautiful flowers! I am so happy your computer problems are all over! Love the photos of the flowers. They are just beautiful. Hi Cindy, I found your blog through another's. 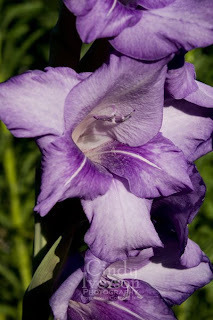 Love the pictures of your Glads and canna lilies. Oooh, pretty. You sure know how to grow the flowers. I think Lucy is cute, by the way. And she likes computers! Lovely canna lilies. I do like lilac colours especially. When we had ponds I planted out a gunnera on the wet area because of it's spectacular leaves. I think irises do well too but the flag iris might try to dominate your cannas. I love the idea of you getting a collection. Sounds so pretty. Oh myyy...that spotted yellow one is GORGEOUS! We're a long way from glad and canna blooms here. Well, maybe in a couple of weeks. Seems like things are growing so quickly now.